Volunteers Lisa Bahadosingh, left, and Cathy DiTuri stop to check a map as they take part in the annual Point-in-Time count in 2016. When temperatures drop, getting a handle on the homeless population becomes an urgent priority. Point in Time (PIT) needs volunteers to take part in a physical survey and help run the PIT headquarters at the Margaret Morton Government Center, 999 Broad St. That is also where training will be to prepare volunteers ahead of time. 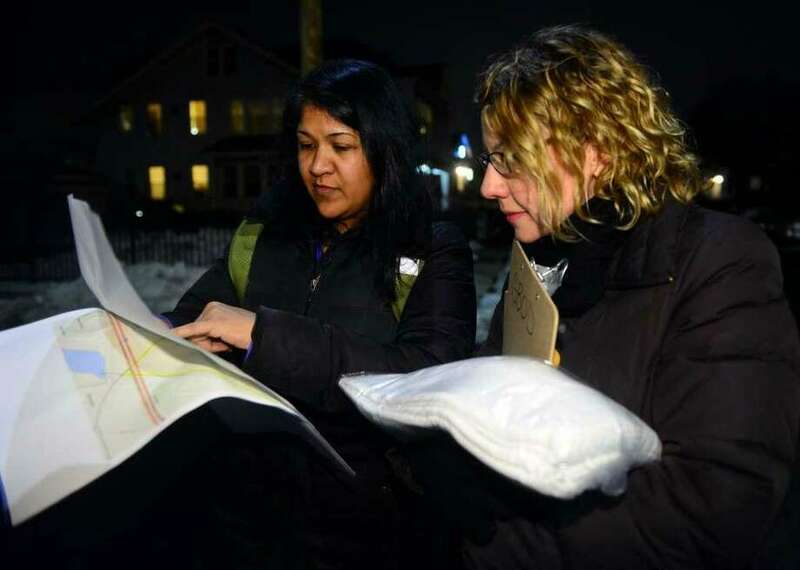 The Greater Bridgeport Homeless PIT Count is Tuesday, Jan. 22, from 9 p.m. to 1 a.m. The snow date is the following day. The PIT is a physical count of homeless persons which takes place in communities across the country. It is mandated by the Department of Housing and Urban Development (HUD) and annually coordinated by Connecticut Coalition to End Homelessness (CCEH) for the state of Connecticut. Volunteer registration is available here. For more information, contact Cheryl Bell at Cheryl.Bell@rnpinc.org or 203-610-8080 x106. Registration deadline is Friday, Jan. 18.